When new technologies make bold promises, how do you discern the hype from what’s commercially viable? And when will such claims pay off, if at all? Gartner Hype Cycles provide a graphic representation of the maturity and adoption of technologies and applications, and how they are potentially relevant to solving real business problems and exploiting new opportunities. Gartner Hype Cycle methodology gives you a view of how a technology or application will evolve over time, providing a sound source of insight to manage its deployment within the context of your specific business goals. How do you use Hype Cycles? Clients use Hype Cycles to get educated about the promise of an emerging technology within the context of their industry and individual appetite for risk. Should you make an early move? If you’re willing to combine risk-taking with an understanding that risky investments don’t always pay off, you could reap the rewards of early adoption. Is a moderate approach appropriate? Executives who are more moderate understand the argument for an early investment but will also insist on a sound cost/benefit analysis when new ways of doing things are not yet fully proven. Should you wait for further maturation? If there are too many unanswered questions around the commercial viability of an emerging technology, it may be better to wait until others have been able to deliver tangible value. How do Hype Cycles work? 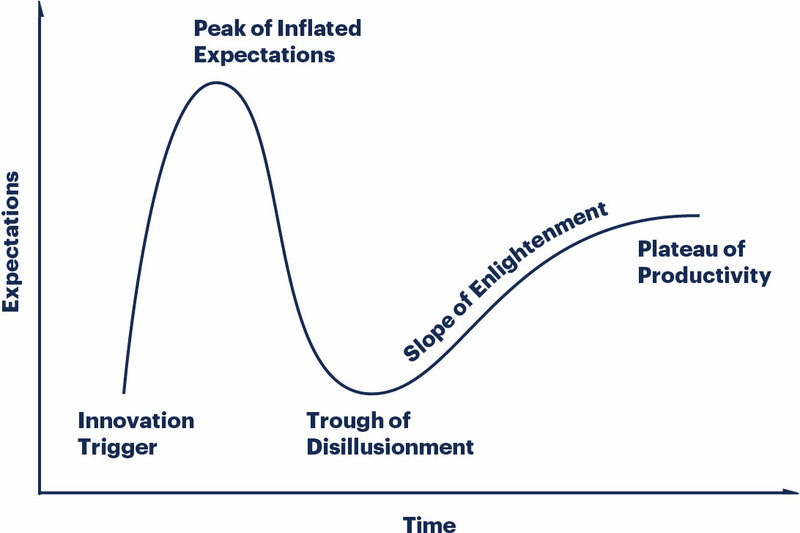 Each Hype Cycle drills down into the five key phases of a technology’s life cycle. Plateau of Productivity: Mainstream adoption starts to take off. Criteria for assessing provider viability are more clearly defined. The technology's broad market applicability and relevance are clearly paying off.